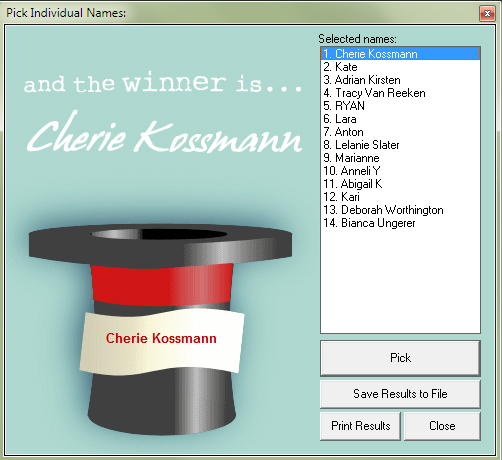 Congrats Cherie, you are lucky winner of the super dooper R 300 wall decal voucher from CrazySexyCool! We would like to thank everybody who entered the give-away, we really enjoyed reading your comments. Also, a special thanks to Chantelle from CrazySexyCool! Be sure to check out the CrazySexyCool Facebook page for future wall decal awesomeness! Thanks peeps, have a gorgeous Monday! 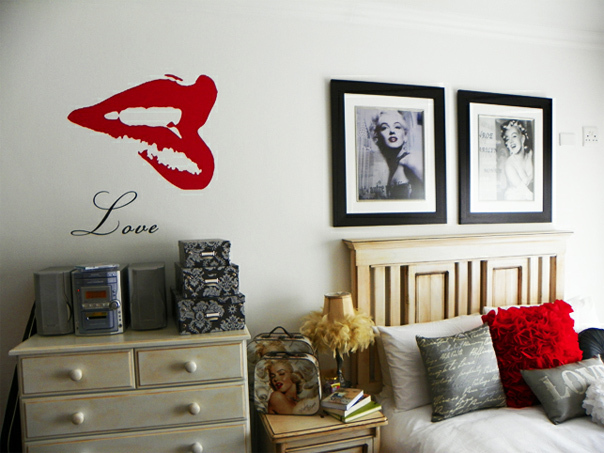 I love Lucy wall decal! 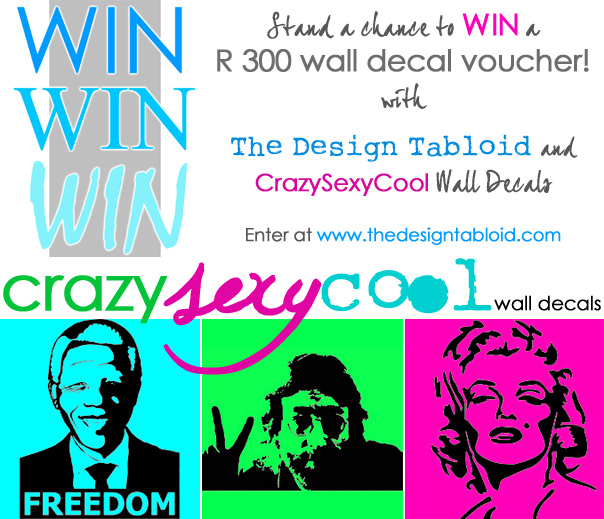 Hey peeps, just a quick reminder that there is only 5 days left to enter our awesome CrazySexyCool wall decal give-away! So if you want to stand a chance to win that super dooper R300 wall decal voucher be sure to enter before Monday the 11th of June! To enter click: HERE and follow the easy instructions at the bottom of the post! CrazySexyCool Wall Decals & GIVE AWAY!! 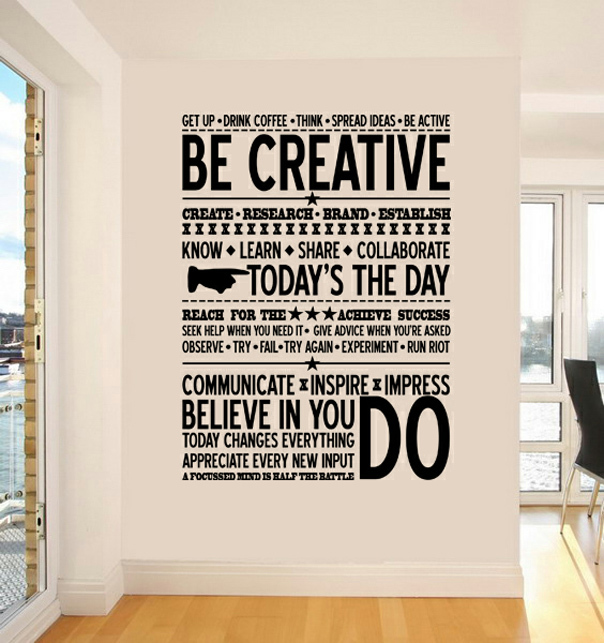 This is crazy… I set out to write about how to give your walls ‘the treatment’ using trendy graphic wallpaper and vinyl wall decals, thinking that I would make one post of it. But as I went along researching all the different styles and suppliers of said wall treatment, my only reaction was to say, in the words of Randy from American Idols, “Yo Dude! !” There is too much to fit into one article. Okay so that has me looking at the trend that seems to have gained considerable momentum in recent times – Vinyl Wall Stickers, also know as Vinyl Wall Decals. We had occasion in the past to have a decal custom made for one of our clients – it was a funky office space. Other than being a relatively inexpensive means of applying art to a wall, it is an extremely easy application as well. Plus the other bonus factor is that you have any image or typography made to order… As the larney folk will say… Bespoke! Particularly fab for application in babies and kiddies rooms. 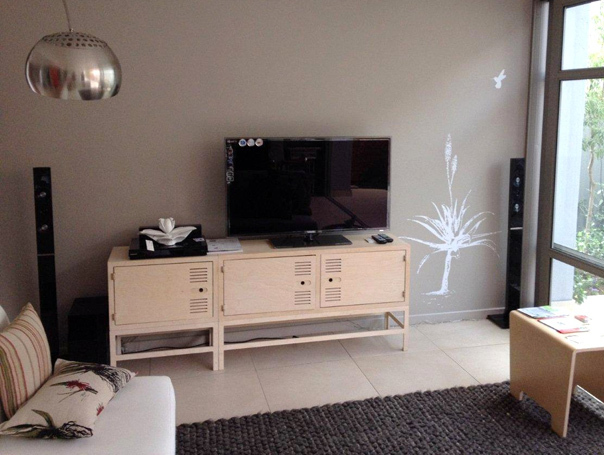 A few months ago, a very proactive young lady named Chantelle from CrazySexyCool a Gauteng based Wall Decal business approached us to feature her work. Since wall treatments was on the ‘to do list’ her timing was great. After Chantelle graduated and got a few letters behind her name, she went on to work in the field of marketing. 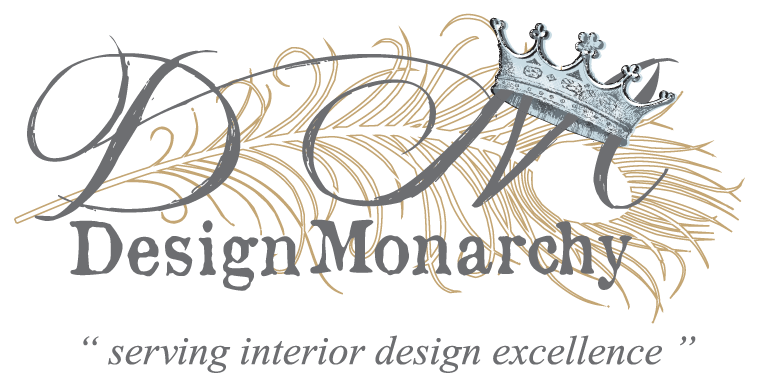 That led her to dabbling in web design, but also had her longing for more tactile design. 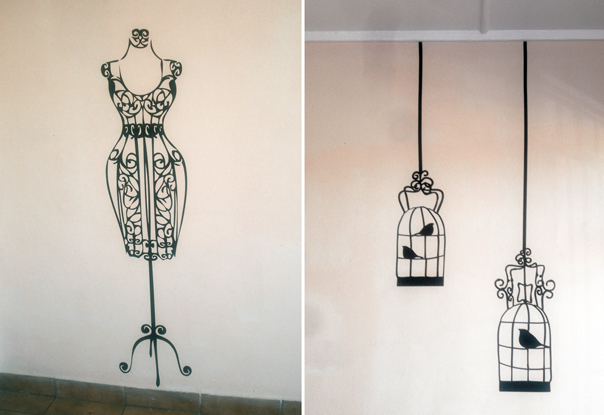 In January 2011 she launched her Wall Decal business and in her words “she has not looked back since”. 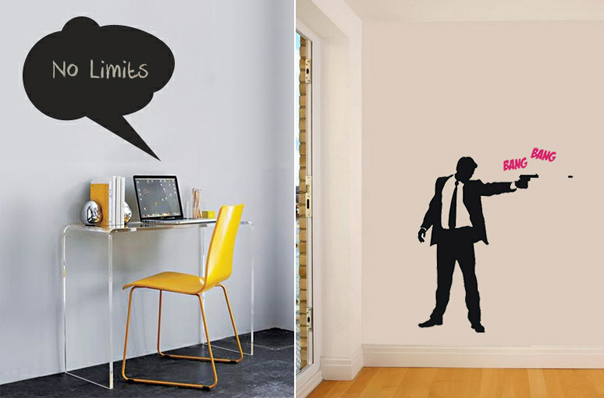 Wall Decals (or wall vinyl stickers) are a fun way to transform any room from blank and boring to stylish and unique.The vinyl used for the stickers are made from high quality vinyl and are available in many different colours, even fluorescents and metallic. Stickers are applied relatively quickly and are very easy to change. Stickers can be stuck on any smooth surface, such as; smooth walls, windows, doors, glass, floors, etc. Wall Decals can be used in offices, shops, on shop windows, homes and even rental homes as it does not damage painted walls. 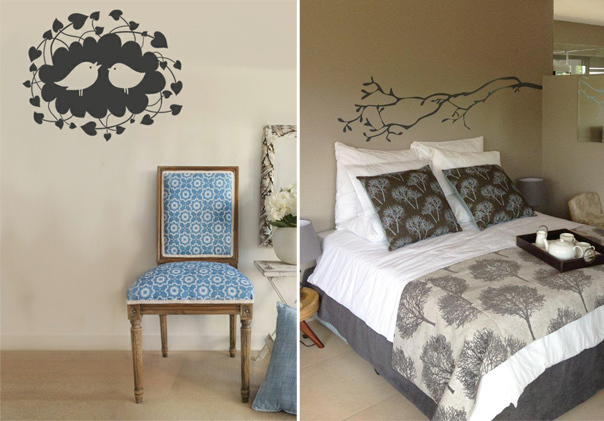 Vinyl stickers for walls are expressions of individual personality and style. When installing there is no mess, as with painting, but the decals can create an illusion of a painted-on design when especially using matt decals. You do not have to have artistic skills or be a state-of-the-art home decorator to turn your plain living space into wonderful one using wall decals. Just like how easy it is to apply, vinyl wall decals are just as easy to remove without ruining the surface of the wall. But whoa good news – because these decals / stickers are so reasonably priced, they could make excellent gifts, for that special person or special occasion. Even a wedding gift if you know the person’s taste and style well enough. More good news! We have an AWESOME R300 GIFT VOUCHER from CRAZYSEXYCOOL TO GIVE AWAY to one lucky participant! You heard right, Chantelle is giving away a gift voucher to the value of R300 to be redeemed against a Wall Decal purchase of your choice from her online shop. 1) Comment on this post below by telling us who you are, what your wall decal of choice would be, and where you will put it (check out the CrazySexyCool websitr to view all the awesome designs)! Unfortunately only people residing in South Africa are eligible for this competition. We will announce the lucky winner on Monday, 11 June 2012 – so be sure to enter before then.